New office space of the Universal GmbH in the commercial and industrial area Achenbach I / II – Lünen. 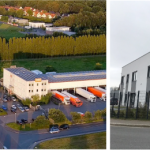 The Universal GmbH is now continuing its business in new office and warehouse space on a plot of land measuring just under 2700 square meters on Wilfried Diekmann Street. In the future, 700 square meters of office space and 3 large storage and training rooms will be available here. Since this month the time has come – the new website is online. With a new design – optimized for desktop PCs, tablets and smartphones – the global certifier presents the certification processes and new regulations. You will learn all about accreditation, personal, company and system certification as well as news in the DAkks regulations. Auditors have the opportunity to download logos, rules and certification processes conveniently and easily. The new Universal GmbH Twitter site is online. The new Twitter page is online. Our Twitter site will notify you of any new information, here for you should follow us. We wish you a lot of fun on our new Twitter-Page! Our new Google + presence is now complete. Our appearance will inform you about all new information, you should follow us. You can assess, rate and criticize our services as well as all other cooperation. We wish you a lot of fun on our new Google+-Page! The Universal GmbH is looking for firm and freelance auditors nationwide for the following standards BS OHSAS 18001 / ISO 50001 / ISO 22000 / ISO 14001 / ISO 9001. Universal GmbH opens additional locations worldwide. Universal GmbH is not only represented in its country of origin Germany, but also in Europe and worldwide! Get an overview of the worldwide locations. Additional branches will be launched under the Universal GmbH. Even if it sounds unimaginable to some of us, there are still people in Germany today who can not afford basic food for themselves or their families. The Universal GmbH has tracked down many of these families – preparing packages of key staple foods and distributing them to these families.